After spending all day flirting on Twitter — and promising "pants off dance offs" — Ke$ha and Pitbull are officially getting it on IRL, hitting the road together for one of the most unlikely tours in recent memory. The trek, announced Friday, will kick off on May 23 in Boston, and criss-crosses the continent before coming to a close on June 28 in Tampa, Florida. Fans of both artists get the first crack at tickets, with a presale set to begin on March 27. General on-sale begins March 29. Australian pop act Justice Crew and Jump Smokers will serve as opening acts. 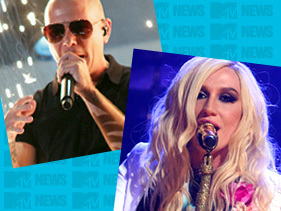 For more information check out KeshasParty.com or PitbullMusic.com. Both Ke$ha and Pitbull — "Kitbull?" "Pit$ha?" — are set to perform at Saturday's 26th Annual Nickelodeon Kids' Choice Awards, with Ke$h doing "C'Mon" and Pitbull being joined by Christina Aguilera for his new single "Feel This Moment." Ke$ha will also hit TV screens this April with "My Crazy Beautiful Life," her new documentary series set to air on MTV. "You might have heard my voice on the radio, seen me onstage or in a music video, but that's only a part of the story," Ke$ha told MTV News about the doc. "With this documentary series I'm revealing a more complete picture of what my life is really like. It's not all glamorous but it's all real."